Having just finished 2 quilts, I don't have a new quilting project to share. I have designed a new Half Square Triangle quilt pattern but the quilt still is still a very young Work-in-Progress! (Too shy to be shown yet)! So I thought I show you what I've made using another mono printing process that I learned on Creativebug.com. This month Creativebug just released a new class series, "Playing with Surface Design: Mark Making" with Courtney Cerutti. 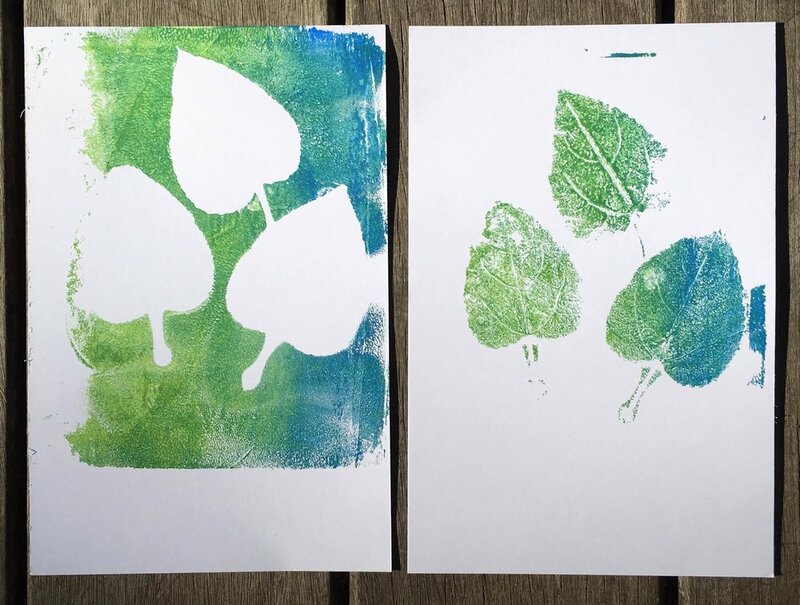 In one of the class segments Courtney shows how to make mono prints using a gel printing plate and acrylic paints. Once I'd collected the necessary supplies, all listed in her class materials, I was able to get right to printing on my kitchen counter! While walking the dogs the other morning, I picked some leaves that look like hearts. I was going to use some asters growing in my yard but it was just after dusk when I finally found the time to do the print. When I went to pick them, the flowers closed up tight for the night! Printing the open flowers would have been great, but there's just no way to get a good print when a flower has gone to bed! I tried!! Here are the plants I'd planned to use. When printing using objects on the gel plate, you can make two different prints each time the plate is loaded with paint. The first print is bold, the second airy with fine details. Since I wasn't able to print the asters on the plate, I got out my watercolor brush pens and drew the flowers in on the second print! (I added some other designs to the first print too)! This process is so much fun! And it's easy! If you are interested in trying gel plate mono printing, I really recommend this Creativebug.com class! And there are two more segments in this class with other easy ways to create surface designs which are also great.